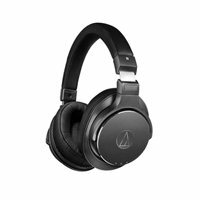 Go wireless with the Audio-Technica Wireless Over-Ear Headphones with Pure Digital Drive. These on-ear headphones have 45mm drivers that deliver frequencies from 5 Hz to 40 kHz. They connect to your device via Bluetooth 4.2 and can remember up to eight devices, connecting automatically to the last one used. NFC is on-board for easy pairing, and LED indicators display connection and battery status.